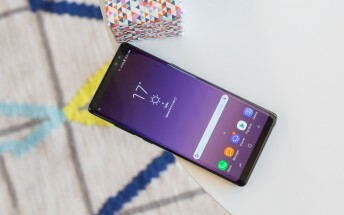 Samsung's Galaxy Note8 became available in the US on September 15 (though pre-ordered units shipped much earlier in some cases), at carriers and in unlocked form. 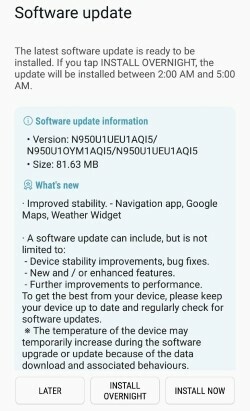 While Verizon's model has already received its first software update on launch day, the unlocked Note8 units for the US are starting to get the same new release today. It's build N950U1UEU1AQI5, and as always you will receive a notification when it's ready to download and install. The size of the update file is 81MB. Expect this rollout to be staged like any other, so remember that it might take a few days to reach all devices out there. As you can see from the screenshot to the left, this update brings with it improvements to stability in Google Maps and the weather widget. Of course we assume that various bug fixes and performance improvements are built in as well. Definitely missing, however, are the September security patches, as after applying this update you'll still be on the August security level. So the newest security fixes will arrive at some later point as part of another update.